Come celebrate the holidays in 1895 Sweetwater Springs, Montana, as ten Western romance authors join New York Times Bestselling author Debra Holland in telling short stories of love and laughter, heartbreak and healing, and most of all, Christmas joy. 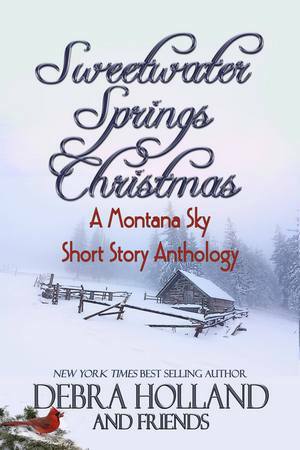 Sweetwater Springs Christmas: A Montana Sky Short Story Anthology is available from Amazon for purchase or read free on Kindle Unlimited. Now available in audio! Check it out at Audible.com. Frank Coleman comes to Sweetwater Springs to ask Adie Reiner to be his wife, but things don’t happen as planned. Frank has been devastated by the plight of the Crow Indians, and when he discovers the indifference and bigotry within the Reiner household towards the Indians, he leaves. But he doesn’t leave alone. Adie and her sister come with him. Adie is determined to help those less fortunate. Free-spirit Richelle Quaid is outspoken, confident and a little bit spoiled. She sets tongues wagging with her bloomers and bicycle but also catches the eye of visiting rancher Landon Howard. An incident with her bicycle causes his prize colt to bolt into the cold Montana night. As Richelle and Landon track the animal together, they can’t fight their growing attraction. Will a wish made on a star foretell their future? US Marshal Benedict Traylor has avoided Abigail Sinclair, his best friend’s widow, since his friend’s death in the spring. Part of his reason is guilt over his role in Marcus’s death. A bigger part is his guilt over the tenderness he feels for Abigail. But it’s winter, and he knows she needs his help. When he arrives and finds her unconscious on the floor of her barn, his plan to stay only a little while flees. As he nurses her back to health, his affection for her blossoms anew. The holiday season brings renowned harpist Blythe Robbins to town to perform at the newly-opened hotel. Timid Blythe is drained from a grueling performance schedule and wants nothing more than to rest and do some soul-searching about her future. Peter Rockwell, shy scion of a prominent hotel family, seeks to gain his experience managing a hotel away from his overbearing family. Can two reserved people overcome their limitations and find love? Elderly hermit Chappie Henderson rescues newly orphaned Ike Tannerson and takes him to town to find a home. As Ike struggles to fit in with his new family, Chappie worries for the boy. But to help Ike, Chappie will need to emerge from his long solitude, something that seems impossible. The town banker Caleb Livingston opens his new hotel, crowning the holidays with a lavish party for the whole town. Although his intention is to advertise his business, in the process, the banker learns that perhaps some things are more important than money. Dr. Carson Raines has one wish for this Christmas; to find his missing wife. He enlists the help of a married couple who are Pinkerton Agents. They find his wife, Ida, living in Sweetwater Springs as a spinster. Ida is pleasantly surprised to run into one of the new boarders at Mrs. Murphy’s boarding house. He’s a handsome doctor who might be able to help her discover her missing past. Spinster Violet Winters is determined to make the best of spending her first Christmas alone in Sweetwater Springs. When she slips and falls one icy cold evening, not only does Rory Townsend, a drifter nicknamed “Tumbleweed” come to her rescue, but the townsfolk rally to help too. Violet quickly discovers what it means to live in a close knit community and that it’s never too late to give up on love and the surprises life has in store. Grace Mayfield leaves behind betrayal and heartache in Kentucky for a new life in Montana. She’ll be satisfied with a stable, happy new home on her cousin’s ranch cooking for the ranch hands. What she doesn’t expect is to find true love with cowboy Andrew Kingston, especially when she’s been failed by love before. Ten-year-old Allison Harcourt’s life has been turned upside down since her father lost his job and her beloved grandmother died. She’s not looking forward to Christmas, especially since she can’t figure out how to finish the scarf she’s making for her mother. An unexpected stop in Sweetwater Springs brings her and her parents to the boarding house of the widow Murphy. Sometimes sweet things can be found in the most unexpected places. Ellie would love to leave her father’s peddling wagon. But spending Christmas Eve locked in the Sweetwater jail is the bossy Cal Barrett’s idea, not hers. How can she possibly sit behind bars when snow melt threatens to wash away her beloved animals, and her dream of finding a home? However, with a little Christmas magic, two searching hearts discover they can bridge much more than a raging river. When Rachel Tanner loses her husband two months before Christmas, the holiday looks bleak for her and her young son, Cass. Then her husband’s brother arrives in Sweetwater Springs to help Rachel make it through the winter, turning her life, and her heart, upside down. Julia Bosworth is a woman scorned. Determined to follow her dreams and not those of her mother, she comes to Sweetwater Springs, Montana to open a sweet shop. Little does she know that in Sweetwater Springs dreams really do come true and Christmas miracles happen.